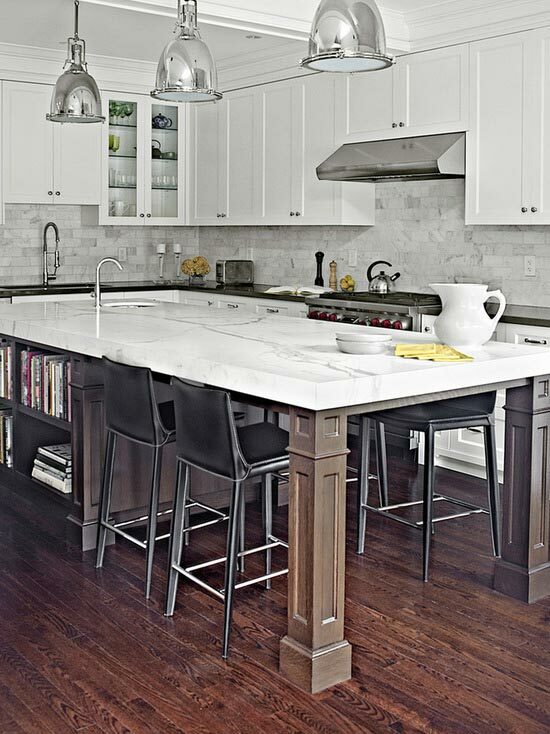 Kitchen island with seating is a must have for every kitchen who has enough space to contain one. Great addition to the interior design and also very functional. 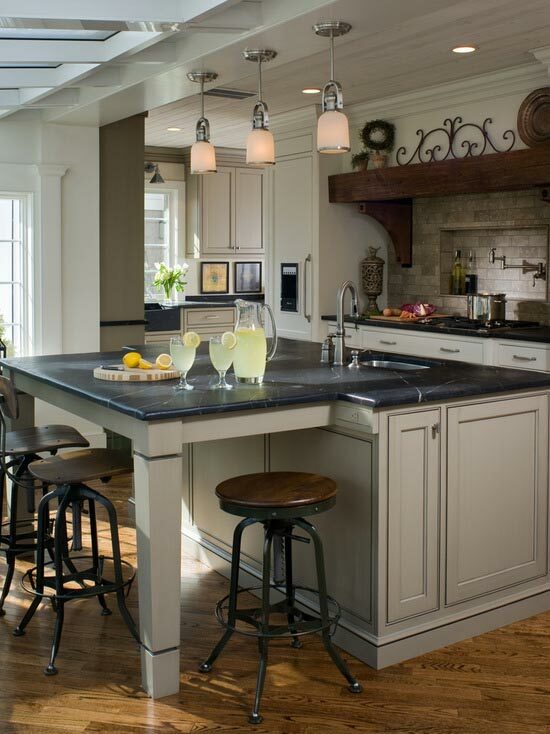 Islands for the kitchen have been around for several years but they’re more popular than ever. Islands look great in almost any kitchen, adding decorative style and beauty. They can also serve several practical purposes. A kitchen island provides extra storage space, more seating, and can be extremely versatile. It’s also a great place for family and friends to gather together in one of the most active rooms in the house. Kitchen islands are practical, attractive, and come in an almost endless variety of styles and designs. There following are several types of islands to consider. There are several choices for materials as well. There’s also the decision of whether to have a mobile island or one that is built permanently into the kitchen. With so many decisions to make it can easily become overwhelming. It’s important to decide if the island will be used primarily for eating and gathering or if the island will be used for food preparation as well. 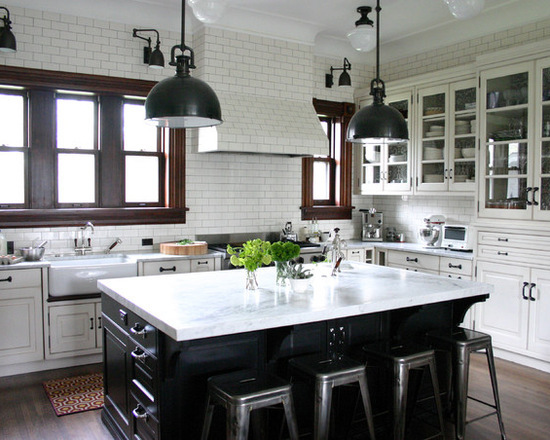 The size of the kitchen should also be taken into consideration when selecting styles and designs. It’s also a good idea to look at several different types of islands when deciding which one will work best for each particular kitchen. The following are 21 beautiful islands to choose from when looking for the perfect addition to your kitchen. A smooth, T-shaped style provides plenty of table space. The contrasting dark and light coloring adds just the right balance. With a T-shaped kitchen island, you will have plenty of space that can be used as a work, sitting and dining area. You can use a mixture of contrasting colors such as with the seats and the island on the photo to give just the perfect eye appeal. With this kitchen island with seating design, you will have plenty of sitting space to accommodate your family and even friends for a warm breakfast. Match the colors of the island with the luxurious chairs in a contrasting manner to bring out a great balance. The colors can match your kitchen’s interior décor to bring uniformity in the kitchen space. The simple design features a contrasting island top with luxurious styling. It also provides beautifully designed, comfortable chairs. This style offers you plenty of space to add several accessories. This kitchen island with seating provides open shelves as well as cabinets that can be used as additional kitchen storage space. You can also integrate your cooker into the kitchen island with this style. A simple design with plenty of space is offered with this kitchen-island. 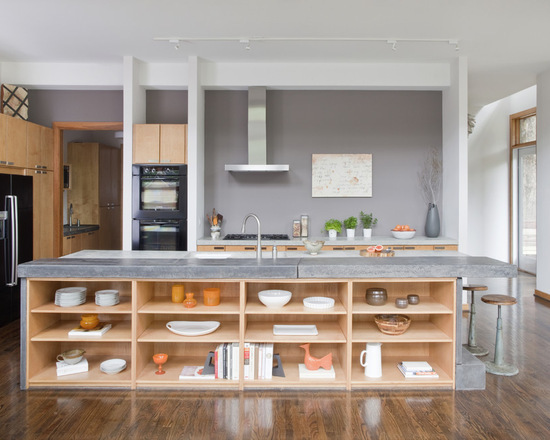 Open shelving and a long, basic design provide several options for adding accessories. This kitchen island allows you to have a unique and exquisite styling that is not only appealing to the eye, but also provides a very functional seating space. The eating area is somehow centrally located, hence allowing the seated individual to have access to either side of the island easily. The corner-kitchen-island offers a completely different look with an “L” shaped design and exquisite styling. This kitchen island provides ample space for all your family members and guests to sit and dine during breakfast. 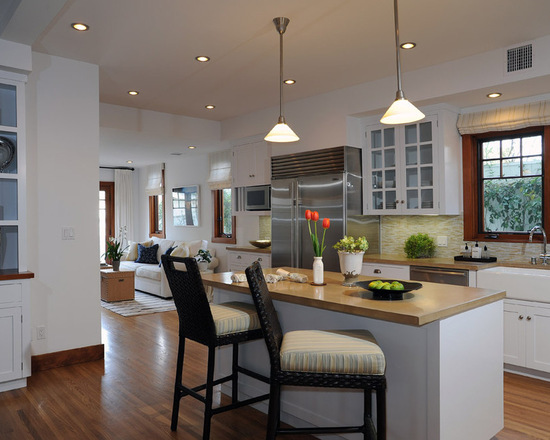 The solid bright white color brightens up the space and perfectly matches the interior décor of the kitchen. 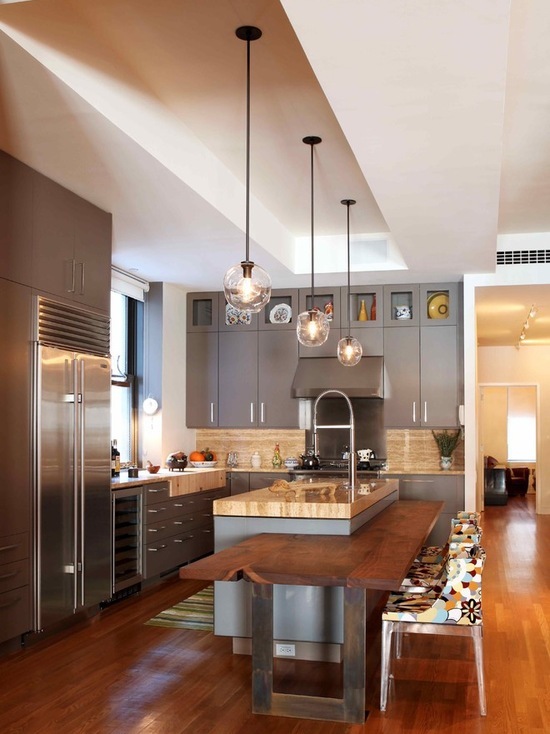 The contemporary wooden seats help create some contrast, spicing up the appeal of the general kitchen space. This large island features plenty of space and comfortable seating in solid bright white. 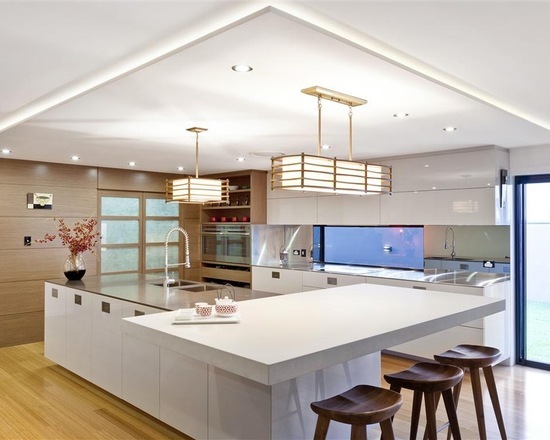 The long L-shaped island is both chic and elegant. 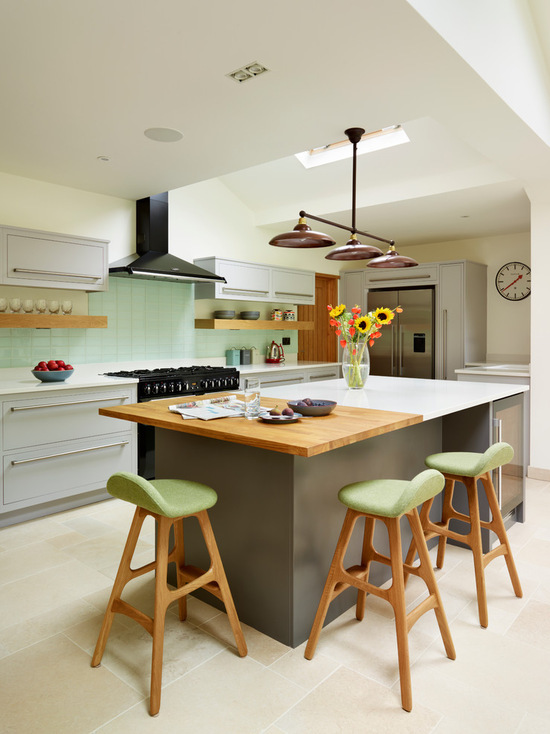 This kitchen island with seating extension provides jus the perfect amount of sitting space depending on your needs. You can re-size it to fit the approximate number of chairs needed by your family members. If you are not into bright colors, this island styling can serve you perfectly. 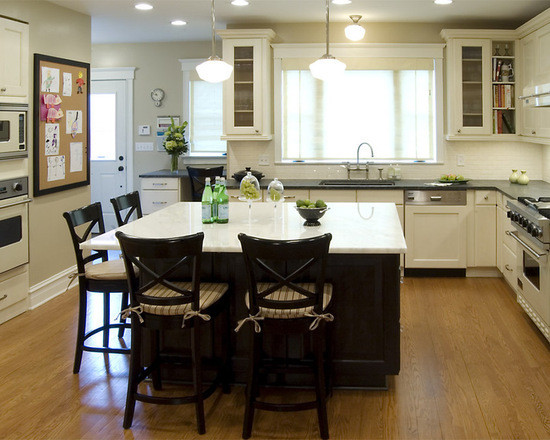 The rectangular island with an extension for seating adds the right amount of extra space. The subdued colors provide a warm, cozy look. This kitchen island with seating offers plenty of space for storing extra items. Drawers and cabinets can be designed depending in the shape and size of the island. Subdued colors for the island base and chairs helps create some contrast in the kitchen’s interior décor balance. This kitchen island combines practical use with chic style and design. Several drawers and storage areas provides plenty of space for extra items. This kitchen island allows you to explore and have some space with great eye appeal. You can use different colors that match well with your kitchens interior décor or create some contrast but in a great way. Some flowers placed on the top of island can also add some contrast and appeal. This unique design creates a futuristic look with just the right amount of color. The contrasting materials on the top of the island offer functionality as well as a great look. 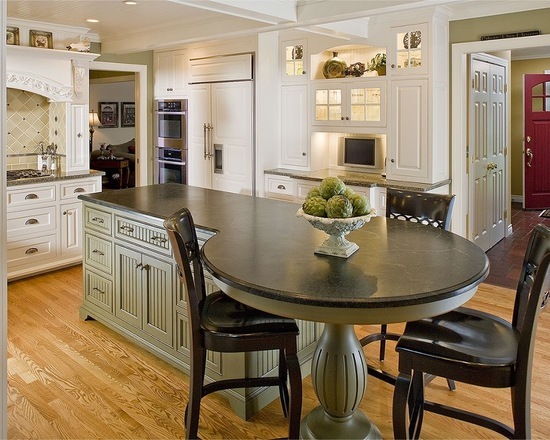 This beautiful kitchen island with seating is just perfect for almost all kitchen types. 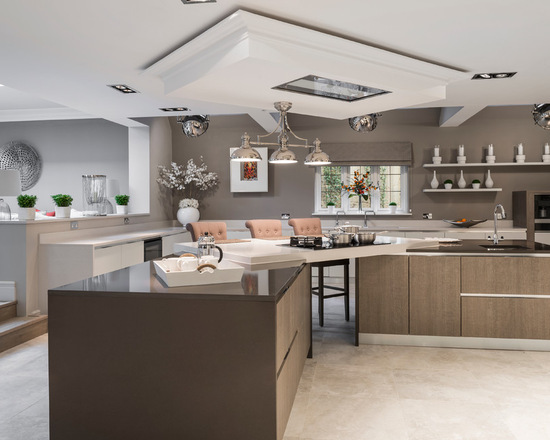 With a simple, elegant and contrasting style, the seats as well as objects placed on the top of this island improve on the general appeal of the whole of the whole design. This clean, simple design would look great in almost any kitchen. The chairs add style and color to the overall look of this beautifully simple design. This simple and solid white kitchen island provides just the perfect ample seating space for you and your family or guests. Its long design allows you space to place several wooden chairs across its side. Having differently colored seats helps accentuate the seating space. This solid white island provides a clean, simple design that would look great in any kitchen. The beige wooden chairs add just the perfect accent. This modern design of a kitchen island with seating space is just the perfect styling for your kitchen if you prefer something that is out of the norm. Having two separate table top levels just creates a striking appeal. In addition, the blending of different colors on the table tops as well as the seats creates an out-of-this world contrast. This sleek yet modern design features a unique style with two separate levels and a striking combination of colors. The seating provides a fun combination of all these different colors. This kitchen island with seating space is not completely rounded, giving it a unique design that is both catchy and functional. The rectangular end has drawers that provide additional kitchen storage space while the rounded end with some sitting space offers a perfect place for simple gatherings in the kitchen. The round-kitchen-island provides a place for simple gatherings in the kitchen. The dark sculpted chairs give the basic design a touch of elegance. Why not spice up the appeal of your kitchen with this rustic kitchen island with seating space design. The rustic table top provides spectacular splashes of color across the island. In addition, these stylishly designed wooden stools give your kitchen space some great casual touch. The rustic design of this island provides incredible splashes of color across the table. The beautifully designed bar stools add a casual touch. 14. Small, simple and beautiful! If you are looking for a small, simple and yet beautiful kitchen island with seating design, this is one of the best options to go for. The island provides just enough needed seating space for you and your partner. With stylish wooden chairs, you can perfectly complement the simple island’s design. For those who are looking for a smaller island this beautifully simple style would be just right. 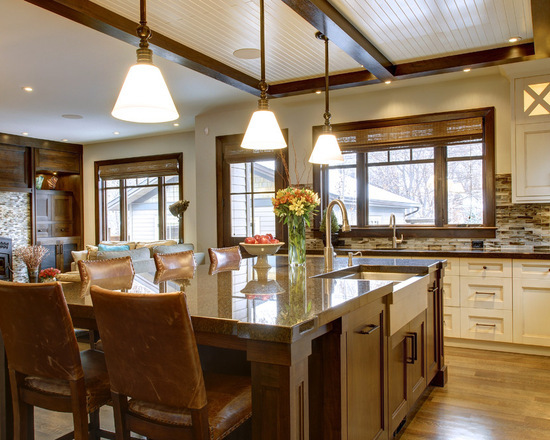 The wooden chairs perfectly compliment the island. This simple square design provides ample seating space on either or all sides depending on how your kitchen is set. 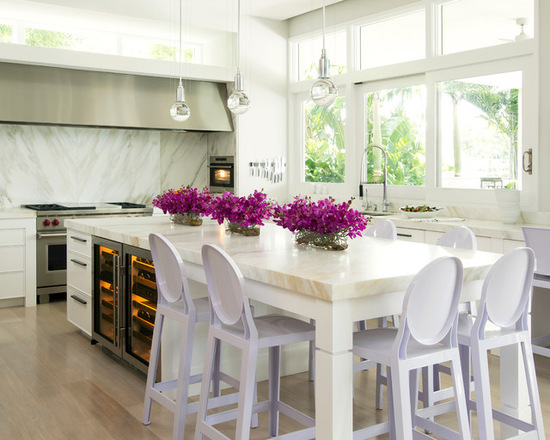 With subdued colors on the base and bright colors on the top, the island has some contrast that is both appealing to the eye and complimentary to the kitchen’s décor. This simple square design offers a cozy kitchen experience and would be perfect for smaller areas. The classically designed chairs provide the right amount of detail. This kitchen island with seating space offers you the ultimate additional space for your kitchen cutlery. Plus, the storage is easily accessible and well segmented for better functionality and improved appeal. A perfect color combination ensures the island is a sight to behold. This island provides the ultimate in easy, accessible storage. The large design also features a nice combination of color. Are you a fun of traditional looks? If you are, this style is of the perfect designs you should look forward to installing in your kitchen. With a sleek wooden base and marble counter-top, this design offers a great and beautiful traditional look. 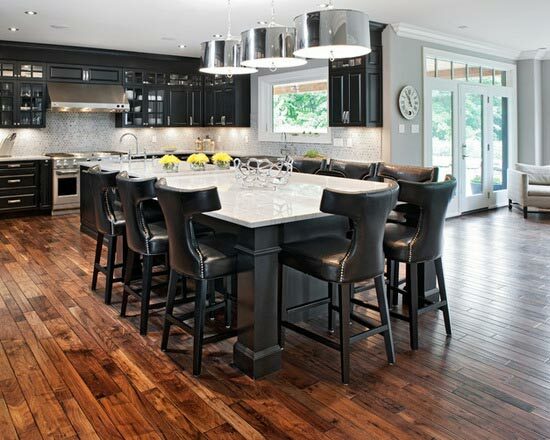 The chairs compliment the brown coloring of the island, delivering uniformity and enhancing eye appeal. 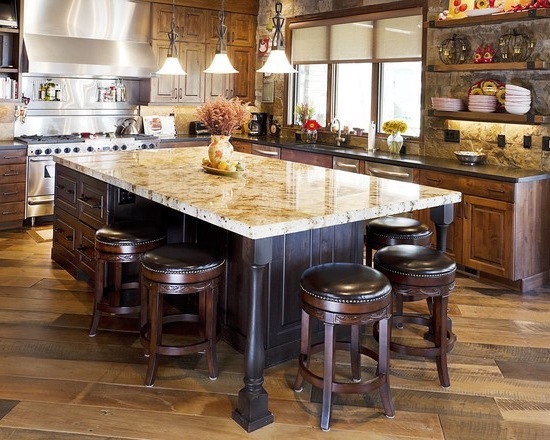 This island features a gorgeous yet traditional look with a sleek design and golden, brown coloring. This kitchen island with plenty of sitting space is just a perfect joint for gatherings in the kitchen. Its basic rectangular design enables it to easily conform to different kitchen types. The sleek wooden design of the island base and its matching chairs make it outstanding. 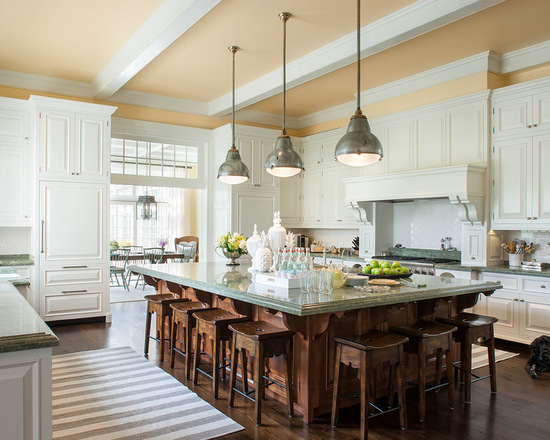 The color contrast of the base, chairs and counter-top gives the island the perfect classic look. This island features a strong, classic look with plenty of seating. This basic rectangular island would look great in almost any kitchen. This kitchen island is a simple design that combines both old-style looks and some modern elegance that can be seen on the counter-top. The wooden base offers adequate open seating space. The counter-top bears a shiny color scheme that brings out a stylish modern look. This gorgeous white marble top is a combination of old-style charm and modern elegance. The shiny yet cool color scheme provides a clean, modern look. There is also a corner kitchen sink installed. 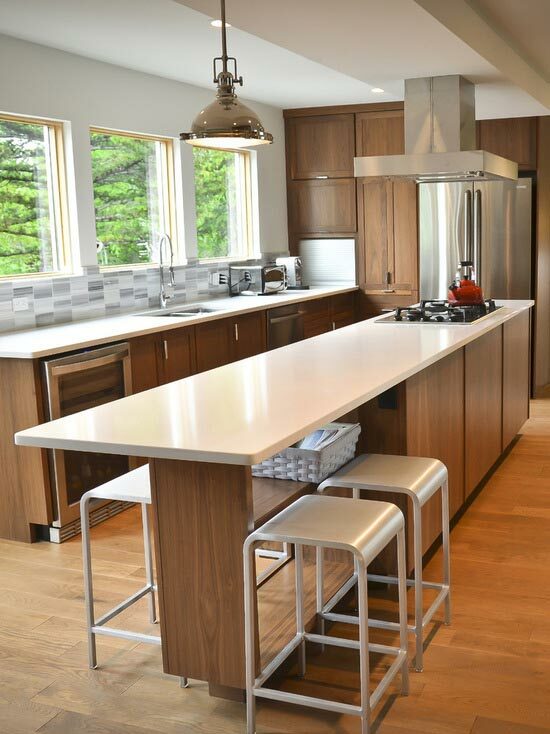 This classy kitchen island with seating space design is perfect for a bright modern kitchen. With a marble counter-top supported by intricately designed posts on each corner, this kitchen island perfectly fits into a modern kitchen. Stylishly crafted stainless steel chairs add to the elegance and appeal of the whole island. 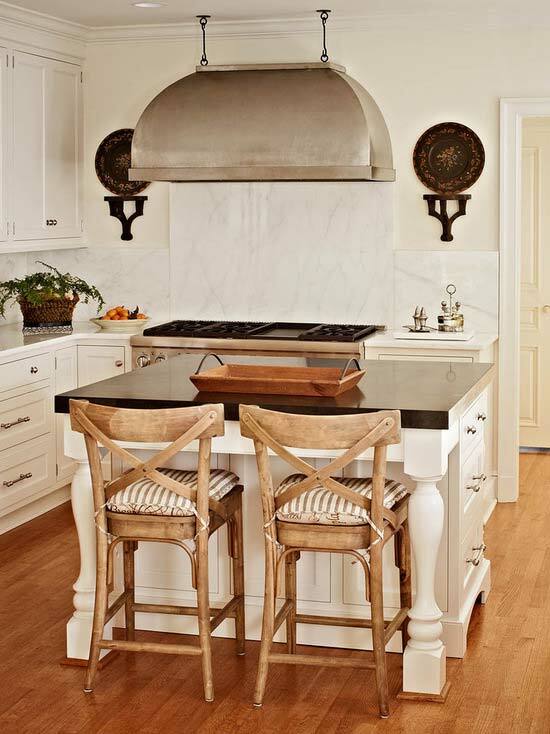 The white marble top is complimented by intricately designed posts on each side of the island. There is also plenty of open shelf space. This kitchen island offers the perfect storage space for your wine with cellars embedded on its base. It also features a very beautiful counter-top and uniquely crafted white chairs that supplement the looks of the whole kitchen. For wine lovers this island offers excellent storage space along with a gorgeous tabletop. It also has pretty white chairs with a unique circular design.